I took these last weekend. I’ve alway declared to everyone and anyone that I prefer winter! But for us, winter means pretty much everything we do in summer minus the swimming. I had no idea what a real winter was until I joined French Fridays with Dorie and began reading blogs from all around the globe. My goodness I was naive! The snow and freezing temps were no longer limited to television. I was reading about real people living in these conditions and the impact of the weather on their daily lives and activities. I was also looking at the most exquisite and perfect photos of snow! My goodness the stuff is gorgeous! We don’t see much of it around here. It’s a real shame! 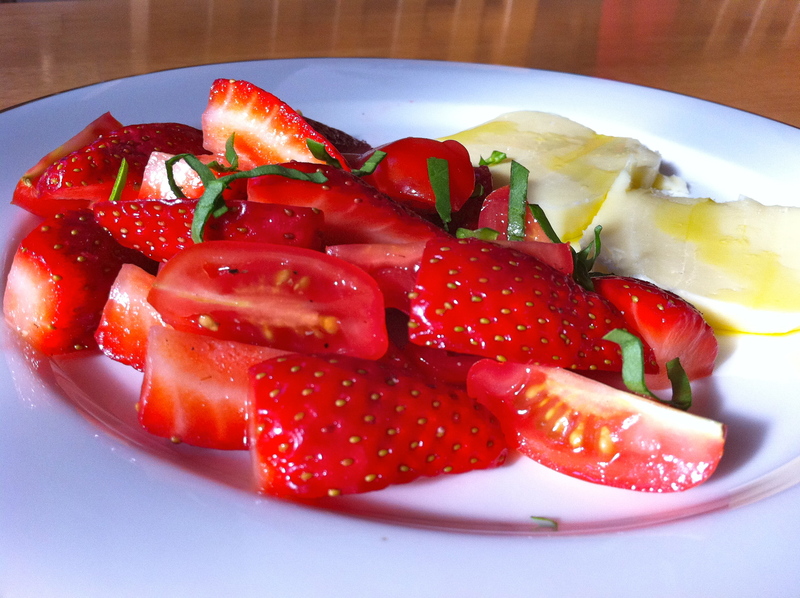 Dorie’s Mozzarella, Tomato and Strawberry Salad. I made just enough for one. Partly because I was hesitant about combining strawberries and tomatoes. And then seasoning with salt and pepper. Mostly because I was home alone for lunch, a rare ocurance! So I chopped up 4 strawberries, 4 tomatoes, seasoned them with salt and pepper and served them next to a couple of slices of mozzarella, lightly drizzled with olive oil. I topped the lot with 4 shredded leaves of basil and a few crushed pink peppercorns (okay, I didn’t have the peppercorns) but it still tasted absolutely amazing! Check out what others thought of and did with, this week’s French Fridays with Dorie recipe. Tags: cooking, food, french fridays with dorie, mozzarella, recipes, salads, strawberries, tomato | Permalink. Your winter is MY kind of winter! Look at all that gorgeous sunlight, and no ones really wrapped up. It’s great that you get strawberries all year round. Half tbe strawberries we eat come from Australia but this time round, none made it here! Mmm, you can enjoy seasonal produce like this year-round? Let me call up my moving company…. Love the pictures & your salad looks like it still fits into your “winter”. wow. just. wow. love your pics! Your strawberries look so red and vibrant! Great post! Love the pics, I’ll be making this one again! Your winter looks like mine! I only wish we could plant strawberries year round (it is usually too hot). I’m glad you enjoyed it! I wouldn’t mind winter either, if I could live where you live! How beautiful! Your salad is also beautiful and how nice you get to enjoy such lovely fruit and vegetables all year long. Nice post! I think most of us would agree you don’t want to trade your winter for ours! I made this salad again tonight using mozzarella and have to say the casatica is better since it has more flavor. Yeah, a tough winter you have there:) I cannot complain as we now live in Southern California, but for years we were battling snow storms in the Midwest:) No more! I love the traditional Caprese salad, and this little twist was wonderful! 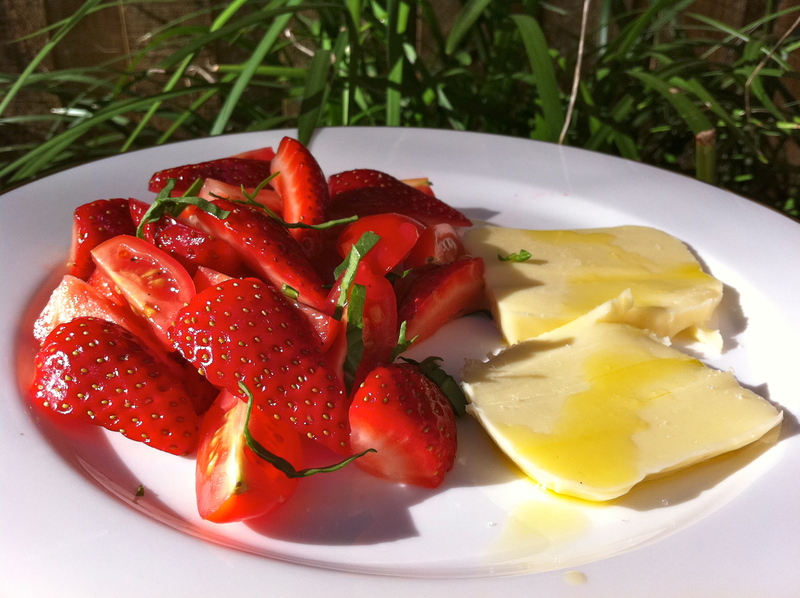 I enjoyed the sweet note of the ripe strawberries against the mild mozzarella and assertive taste of basil. Ha! Your winter looks nicer than our summer, even. Your salad looks terrific. How lucky to be able to have gorgeous strawberries in winter. Nice job on the salad. I hope you had an enjoyable lunch solo. 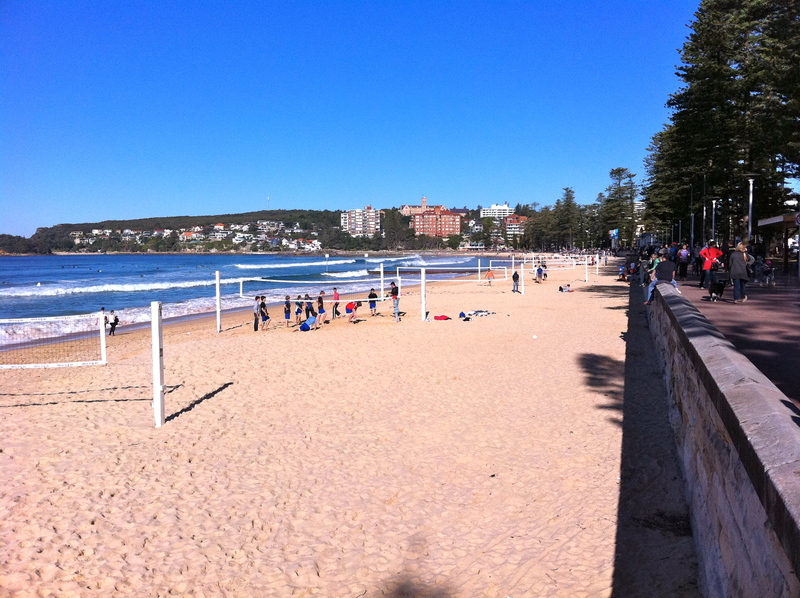 I was at Manly beach in January on vacation, what a beautiful fun place! Beautiful and I’d love to be on that beach. It is so hot here right now it is like opening the oven door and sticking your body in, but I love it. I have become so accustomed to the heat that I have a hard time going anywhere else, but I think I could handle your winter just fine…looks lovely, and so does your salad. I was hesitant about the strawberries and tomatoes together too, but it works. It’s not an intuitive combination, but it works really well, doesn’t it? 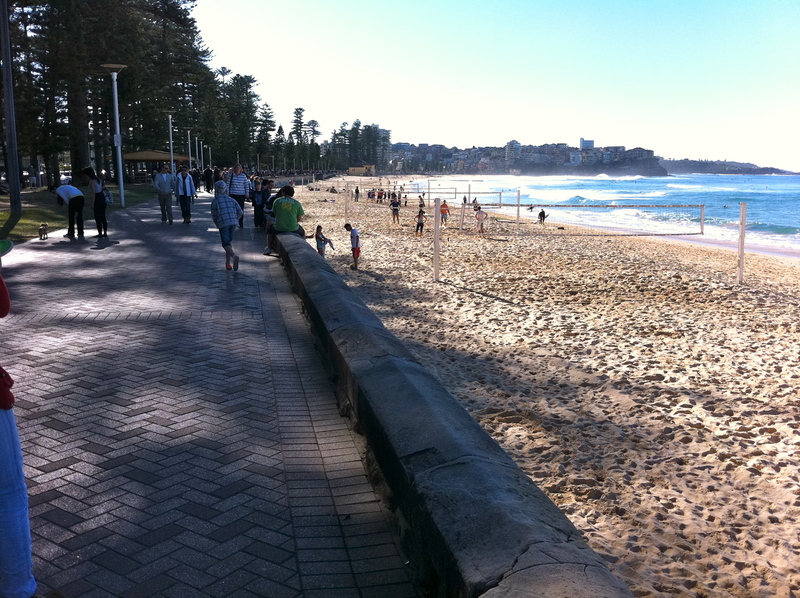 Your winter looks lovely – swimming is probably not much to give up when you still have such lovely-looking weather. I think I could easily get used to living where you live! 🙂 Your salad looks delicious.